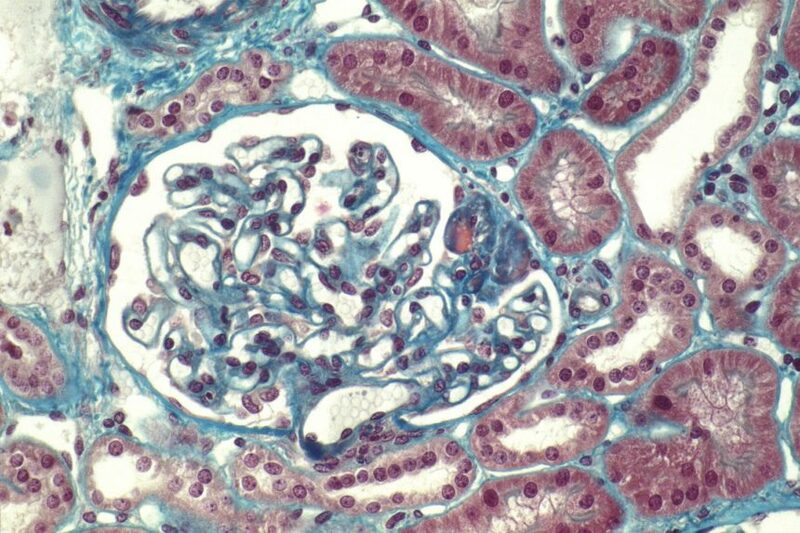 CHICAGO—Sparsentan, a novel dual-action drug, shows promise for the treatment of focal segmental glomerulosclerosis (FSGS), a kidney disease for which no FDA-approved pharmacotherapy exists, researchers reported at the American Society of Nephrology’s 2016 Kidney Week meeting. In the phase 2 DUET study, patients with FSGS treated with the drug experienced a mean 44.8% reduction in proteinuria—the primary study endpoint—from baseline compared with an 18.5% mean reduction among patients treated with irbesartan. The mean reduction of proteinuria from baseline after 8 weeks of treatment was 47.4% for all patients treated with 400 mg and 800 mg doses of sparsentan versus 19% for patients receiving 300 mg of irbesartan. Results also showed that sparsentan, which combines endothelin receptor type A blockade with angiotensin II inhibition, is generally safe and well-tolerated. The DUET study is an international, randomized, double-blind clinical trial in which investigators randomly assigned 109 FSGS patients aged 8–71 years to receive daily oral doses of 200 mg, 400 mg, or 800 mg of sparsentan or 300 mg of irbesartan. After an 8-week treatment period, all patients were eligible to receive sparsentan as part of the study’s open-label extension. Investigators included 96 patients in their analysis. After the 8-week treatment period, 28.1% of sparsentan recipients achieved the secondary endpoint of modified partial remission of proteinuria (urine protein-to-creatinine ratio [UPC] of 1.5 g/g or less with a greater than 40% reduction in UPC at week 8) compared with 9.4% of irbesartan-treated patients, a significant difference between the medications, Dr. Trachtman and his colleagues reported. After 48 weeks of sparsentan treatment, 57.7% of patients achieved modified partial remission. In addition, 50% of patients who switched from irbesartan to sparsentan at the beginning of the open-label period achieved modified partial remission after 40 weeks of treatment. Four patients receiving sparsentan during the 8-week treatment period achieved complete remission (UPC below 0.3 g/g) compared with none of the irbesartan recipients. 1. Trachtman H, Nelson PJ, Komers R, et al. Efficacy and Safety of Sparsentan, a Dual Angiotensin II (Ang II) and Endothelin (ET) Type A Receptor Antagonist, in Patients with Focal Segmental Glomerulosclerosis (FSGS): A Phase 2 Trial (DUET). Data presented at the 2016 Kidney Week meeting in Chicago, Nov. 15-20. HI-OR06.